Nike Air Max Typha 2 has just been released by Nike. Our experts are working on a detailed review. Please, come back later. 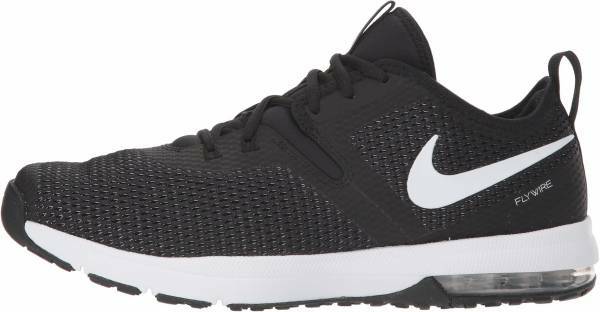 The Nike Air Max Typha 2 is part of the extensive line of Nike training shoes for men. It is a follow-up to the Air Max Typha. It still uses its signature Max Air unit in the heel for shock absorption and cushioning. While the current iteration’s style is reminiscent of the original, there have been several improvements to the construction of this model. One is the upper. It now has a partial bootie design for a sock-like fit. It also uses a breathable mesh upper for improved ventilation. It has done away with the injected TPU cup at the heel and replaced it with overlays. It still serves to stabilize the heel and prevent wobbling and heel slippage. The Nike Air Max Typha 2 is structured to suit the foot kinesiology and dimensions of men. Its sizes range from US 6 to 18, with half sizes in between extending from 6.5 to 12.5. The shoe only comes in one width option, which is the D-Medium. The Nike Air Max Typha 2 has an outsole that is entirely made of rubber, a material known for its traction and durability. The underfoot is distinctively textured to deliver a dynamic grip on different types of surfaces. The midsole of the Nike Air Max Typha 2 employs the Max Air technology. It is a lightweight, versatile, and durable form of cushioning. It is made of multiple Air-Sole units, tough membrane compartments that contain pressurized gas. Upon impact, the air compresses and immediately goes back to its original form and volume, giving a much-needed bounce to the next step. The foot is enveloped in a breathable mesh upper with the Nike Air Max Typha 2. This fabric allows air to circulate throughout the foot chamber while also expanding with the foot. TPU overlays are placed on the high-wear areas of the footwear to enhance durability. It is fashioned into a partial bootie construction to give a snug fit. A set of Flywire cables can be found in the midfoot and arch for additional support where it is needed. They do not weigh the shoe down, therefore maintaining its lightweight form. A traditional lace-up closure is used to secure the shoe on the foot. It also helps to boost the lateral support as it reinforces the sides when the shoelaces are tightened. The pull tab attached to the footgear runs from the heel counter through the Achilles’ heel. It allows the wearer to pull the shoe easier. Nike released a range of NFL-themed colorways for the Air Max Typha 2. The collection consists of 15 new colorways that represent NFL teams such as Pittsburgh Steelers, Packers, Dallas Cowboys, New England Patriots, San Francisco 49ers, Chicago Bears, Denver Broncos, Philadelphia Eagles, New York Giants, New York Jets, Green Bay Packers, Oakland Raiders, Los Angeles Rams, Washington Redskins, Seattle Seahawks, and Houston Texans.